NASA budget 2015: More cuts, more politics. Every year, when NASA releases its White House budget request, I open the report with dread. Will it show that things are roughly the same as last year, or will there be more bad news, with slashes and cuts to vital programs? And this year, like every other, I read it to find … both. 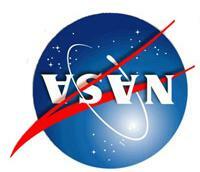 The Fiscal Year 2015 NASA budgetary request is hammered out by the White House with input from the space agency. It is a request; it’s not final. Congress must put together its own budget, and then the two are thrown into a pit to see what can be agreed upon, what can be reconciled, and what compromises can be found. Think of it as a baseline for the actual budget which will hopefully be finalized later this year. As usual, from what I can see, there’s good news and bad news in this. The real bad news is that the good news is only so-so, and the worse news is that the bad news is pretty bad. In these maddening economic times, small cuts can be considered victories. In 2014 NASA got a total of $17.646 billion. The 2015 request is for $17.460 billion, a reduction of $186 million dollars, or about a 1 percent cut. That could’ve been worse. As we’ll see, though, it’s where those cuts are going that are bad. Some areas got more money, like Space Technology. That includes tech that will help the proposed asteroid retrieval mission. I have misgivings about this mission; the goal isn’t yet clear, nor the source of the estimated $2.6 billion it will cost in total. The development of the tech needed for it will be useful no matter what, which is fine, but I still fear NASA will have to cut other missions to fund this one. Commercial Spaceflight will see an increase of more than $150 million to a total of $848 million. That includes buying launches from commercial companies like SpaceX, and I’m all for that. That comes with a $300 million reduction to the Exploration Systems Development, the category that includes developing the Orion crew capsule and the Space Launch System, the next-generation rocket. I am not a big fan of the SLS, since I don’t think it pushes boundaries like NASA should be doing; these types of capabilities may be better handled by private companies that can do so more cheaply, motivated by NASA funding (interestingly, former NASA Deputy Administrator Lori Garver has reportedly had similar doubts about SLS). This is a complex political football, though. Still, I have no doubt this will continue to get a large chunk of funding for the next few years. Other projects got modest increases, including Heliophysics (yay; studying the Sun is important) and a few others. I’m happy to see some funding to look into a new Europa mission as well; we definitely need to go there! But then there’s the bad news. But the one that really gets me, the one that is appalling, is the cut to Education: It will see a devastating reduction in funding of nearly $28 million, dropping to $89 million if this budget is passed as is. That’s nearly a 24 percent drop. This is madness. I can’t brand it any other way. One of NASA’s shining triumphs is public advocacy, from creating educational products to garnering public interest in the overall mission of exploring the Universe. This cut seems to align with the bizarre notion of taking the educational efforts away from NASA and giving it to outside museums and the Department of Education. These are excellent groups, to be sure, but there is a wealth of experience in NASA’s Education and Public Outreach groups, hard-won over the past decade or so. I was involved with that, so I have first-hand knowledge; mission-specific E/PO with cooperation between those missions was working pretty well. There’s no need to change this and to my knowledge no one in NASA asked for it. It was simply decided from above. I think that’s a big mistake. Again, let me remind you that this is a budget request. Congress will have a different budget for NASA, one that will hopefully restore some of the cuts. Congress-critters have wisely fought for more money in planetary exploration (NASA’s highest-profile space missions in many ways), so there may be hope yet. Every year, watching this process unfold is like watching a car crash in slow motion. And it’s nuts from the start. NASA’s budget is a pittance compared with pretty much everything else the government does. President Obama’s proposed national budget for 2015 is $3.9 trillion. NASA’s budget is less than half a percent of that (0.45 percent to be more accurate). To give you a sense of scale, take a one dollar bill, and a pair of scissors. They’d better be sharp: Slice off a sliver just 0.7 mm wide off the end—that’s about 1/40th of an inch. That’s the total amount of NASA’s budget compared with what we spend overall. A slice that narrow won’t even reach the ink printing on the bill. 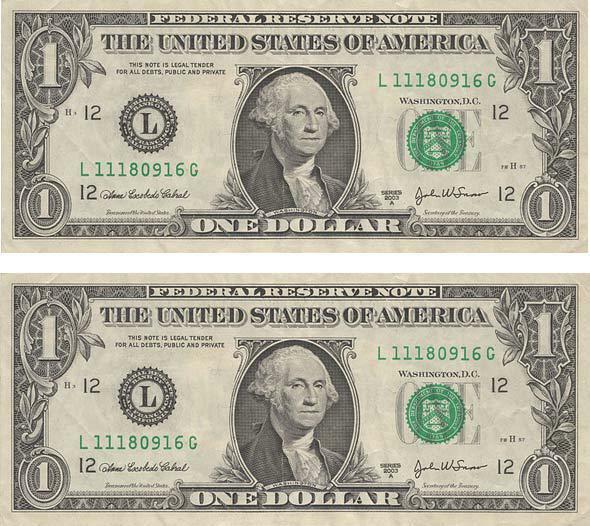 One of these dollar bills is 0.45 percent thinner than the other. Can you even tell? That’s what we’re fighting over here, a razor-thin piece of the budget so small it’s dwarfed by the amount of money underreported to the IRS every year (by a LOT). It’s like running out of room on your hard drive and spending hours deleting a 4 KB text file, when there’s a directory filled with honking big 4 GB movies you’ll never watch again eating up space. And to mix a metaphor, starving space is what we’re doing. NASA’s budget is so very, very small, and yet what it does with it is amazing. We have spacecraft orbiting Saturn and Mercury and sitting (or roving!) upon the surfaces of the Moon and Mars. We’re studying our own planet, finding thousands of others, mapping the Universe to the very edge of what we can see. We’re learning about weather systems and our climate, putting humans into orbit to see what we can do there, and exploring everything up, down, and in between. And we get the chance and honor to let people know all about it. It’s a common joke on the ‘Net to say we live in the future. But look again at what NASA does, and tell me we don’t. We can have all that, and so much more, for just a small fraction of the edge of the border on the side of a dollar bill. A sliver that buys us the Universe. Why are we slicing it even more?